Pollinators are essential in flowering plant reproduction and in the production of most fruits and vegetables. Many pollinators are in serious ecline. Here are a few key web sites with information about pollinators. The North America Pollinator Protection Campaign encourages the health of resident and migratory pollinating animals in North America. 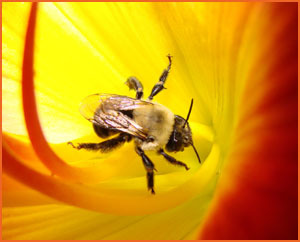 Check out their useful resources: http://pollinator.org/education.htm. Pollinators are responsible for assisting over 80% of the world's flowering plants. Without them, humans and wildlife wouldn't have much to eat or look at. This web site contains information about a variety of pollinators as well as information about pollination, plant pollination strategies, pollinator syndromes, pollinator friendly practices, gardening for pollinators, and more. The U.S. Fish and Wildlife Service web site contains a featured pollinator, threats, how to help, education materials, links, and more.